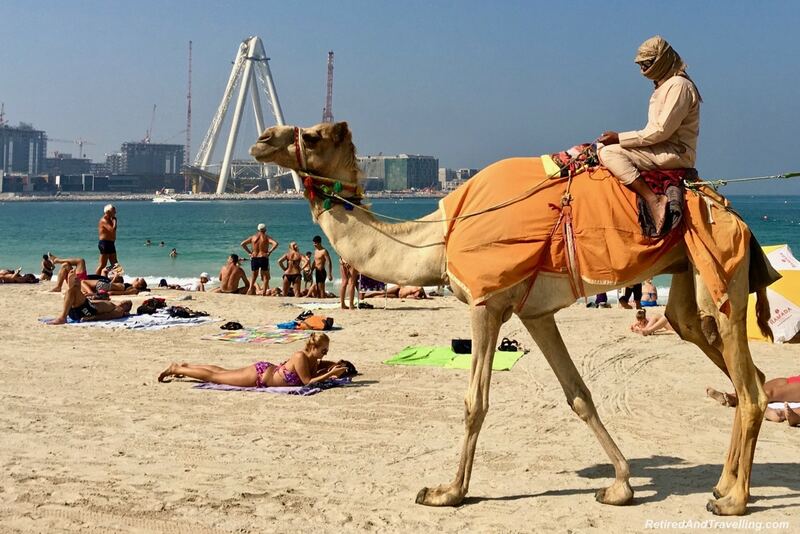 There is no end of things to do in Dubai. The architecture of this city will keep you looking up at the variety and size of the buildings. 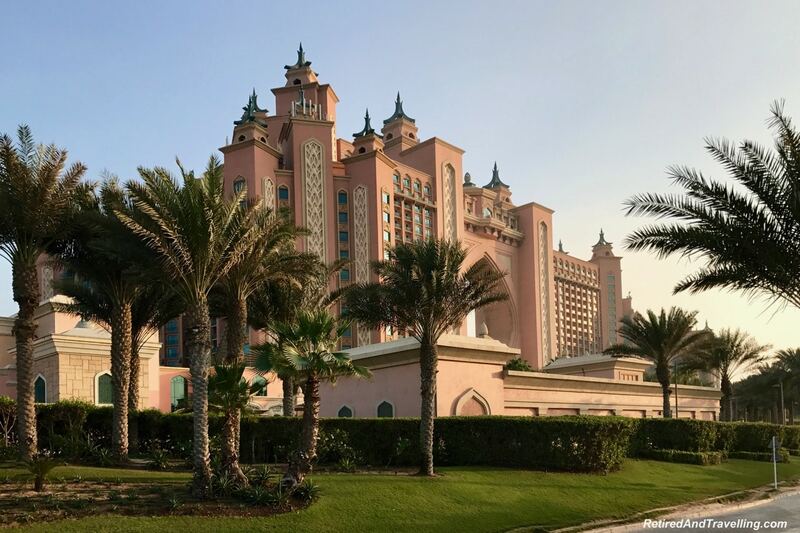 A trip out along the Palm Jumeirah took us to visit the Atlantis Resort. We relaxed on the beach and headed out of town to see the vast stretches of sand in the desert. 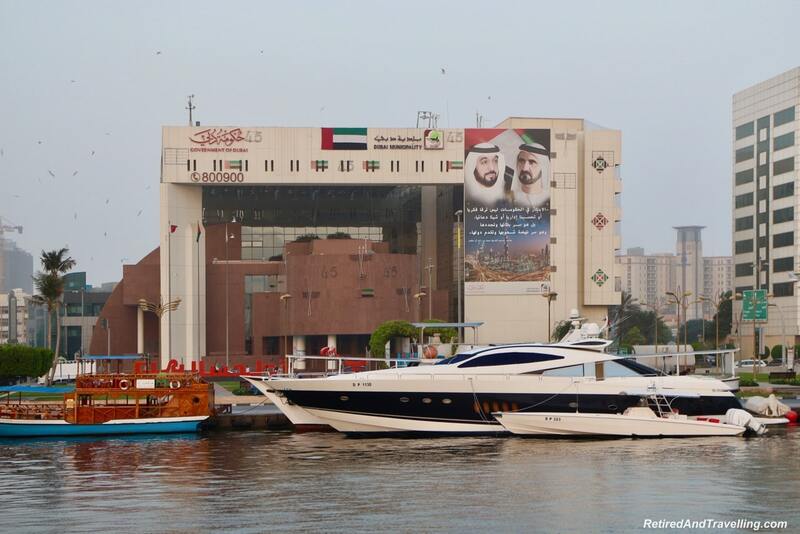 Two harbour cruises showed us two very different parts of Dubai from the water. When we wanted to see Dubai at its most entertaining, we spent some time at the Dubai Mall. 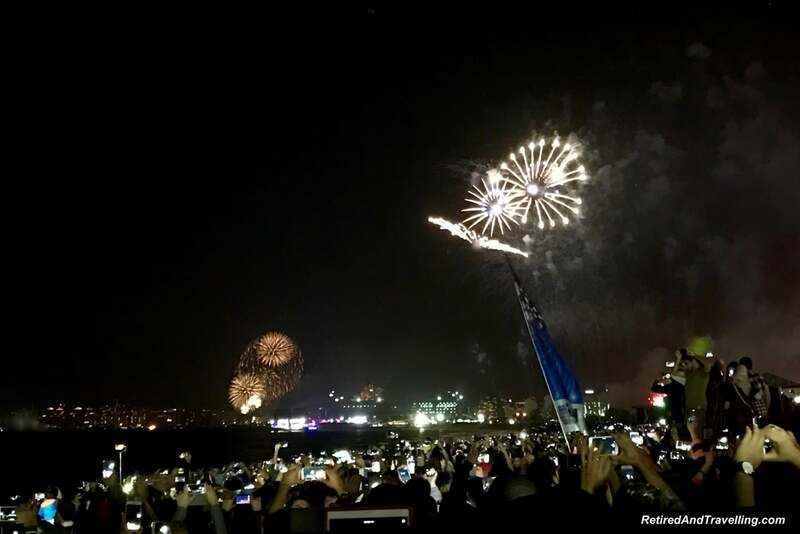 And then there was New Years in Dubai for a great night show! If you get bored in Dubai, it is an easy trip to visit one of the other emirates! Dubai is known for its architecture. It seems that each building that goes up, strives to be different from all others. The geeky engineer in me spent a lot of time with her neck craned up to take in the buildings as we moved around Dubai. There was so much variety in colour and shape. I would have this same engineering awe when we did the river architectural tour in Chicago! 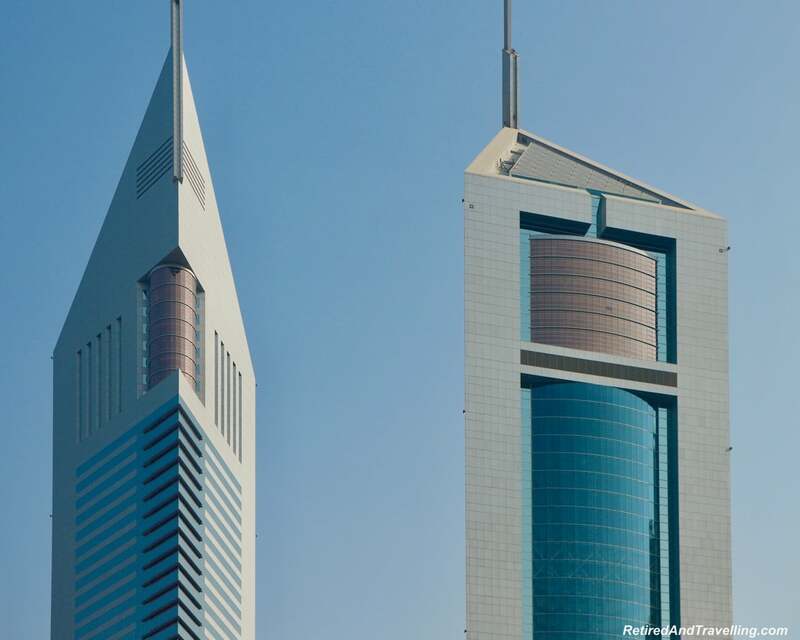 There are two iconic buildings in Dubai that everyone knows. 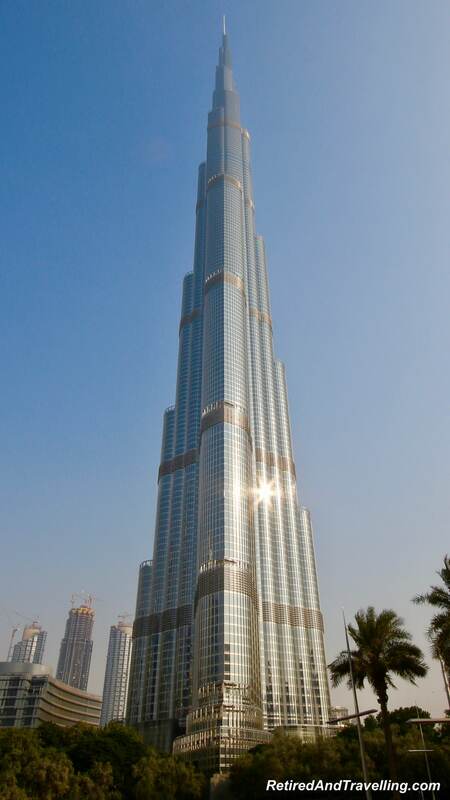 The Burj Khalifa located behind the Dubai Mall is the tallest building in Dubai. The weather did not cooperate when we visited so we did not get to see the amazing panoramic views from the top. 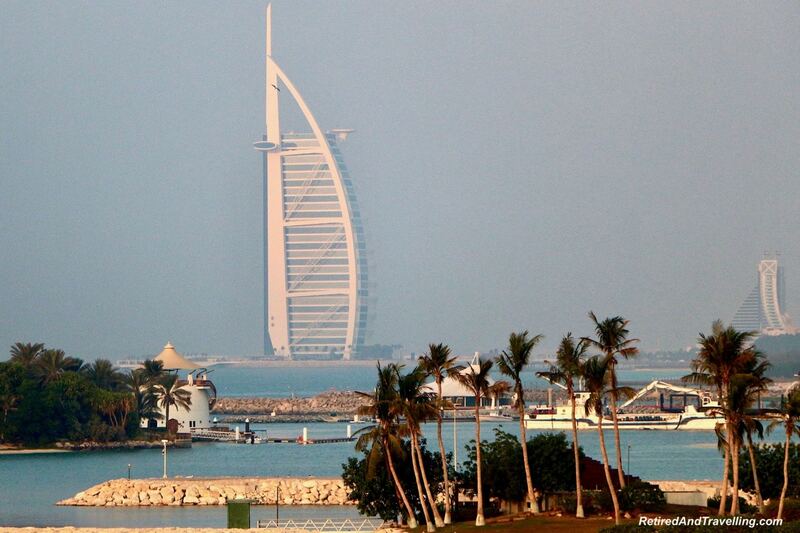 The other distinctive building is the Burj Arab. It sits on the waterfront and looks like a sail. 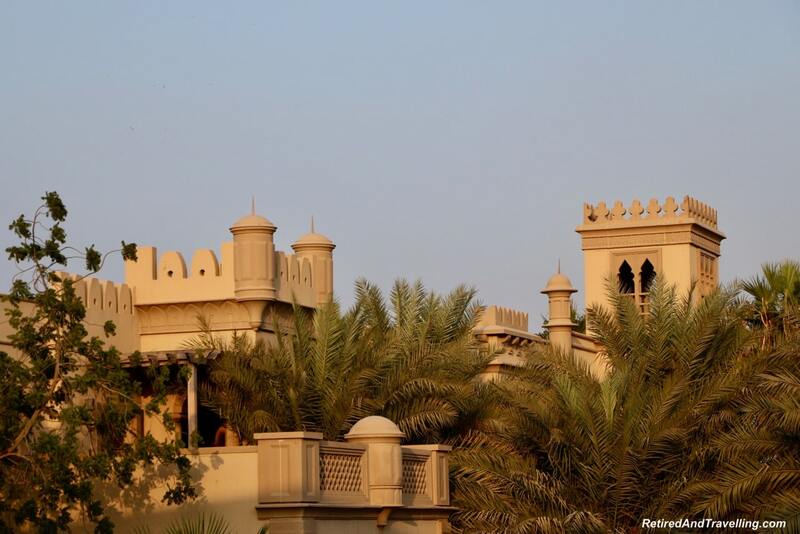 As we drove around Dubai, we also saw more traditional buildings and mosques. They were artistic and intricate in a different way than the sky scrapers. 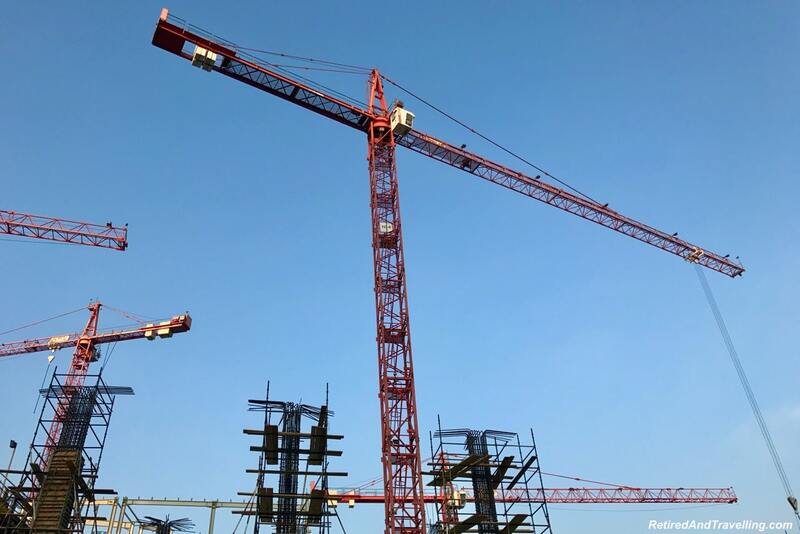 Everywhere we looked we saw construction cranes. The city just kept going higher and higher. 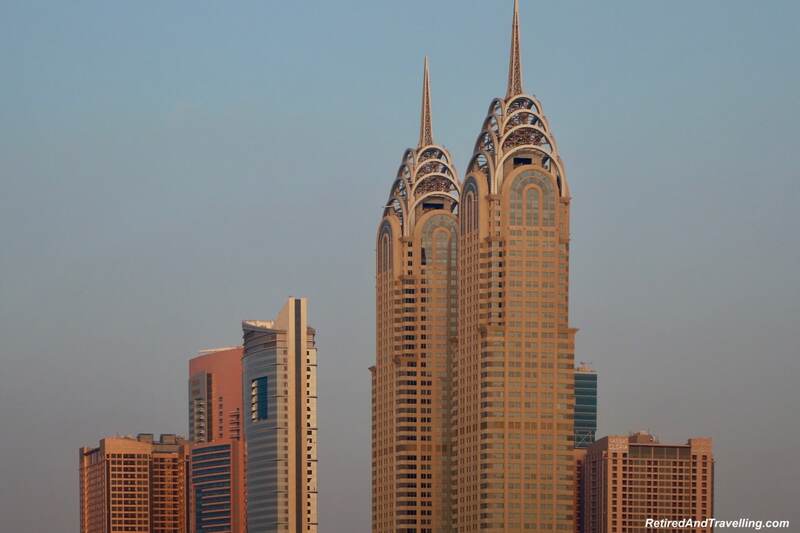 Looking at the fascinating architecture was one of our favourite things to do in Dubai. 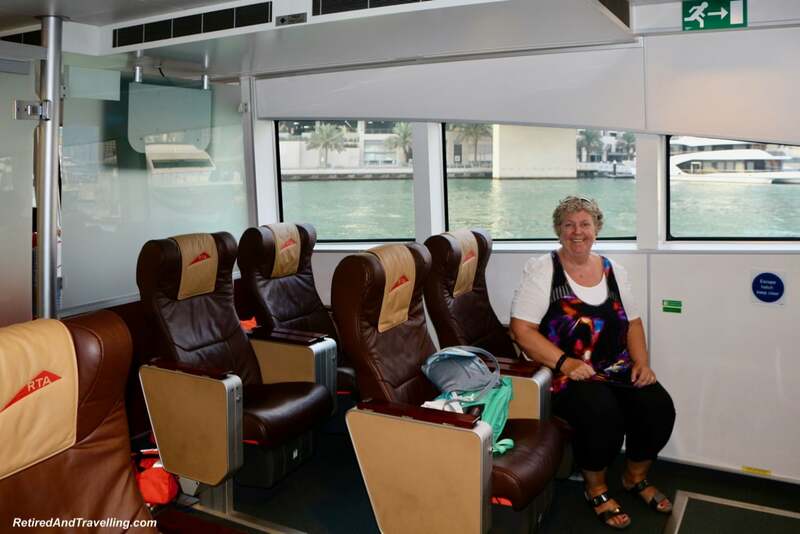 On our first visit to Dubai, we used the Hop-On-Hop-Off (HOHO) bus for two days. 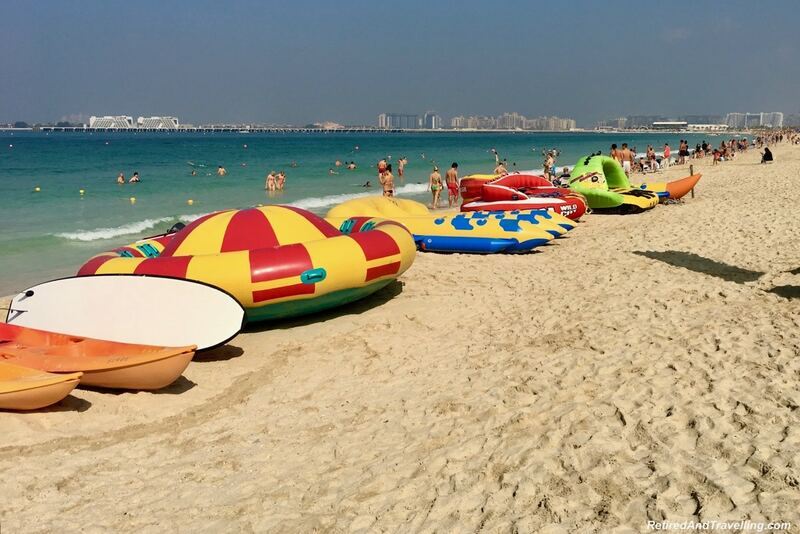 The first HOHO route we used was the one that took us out along the Palm Jumeirah. We wanted to see the Atlantis Dubai Resort. 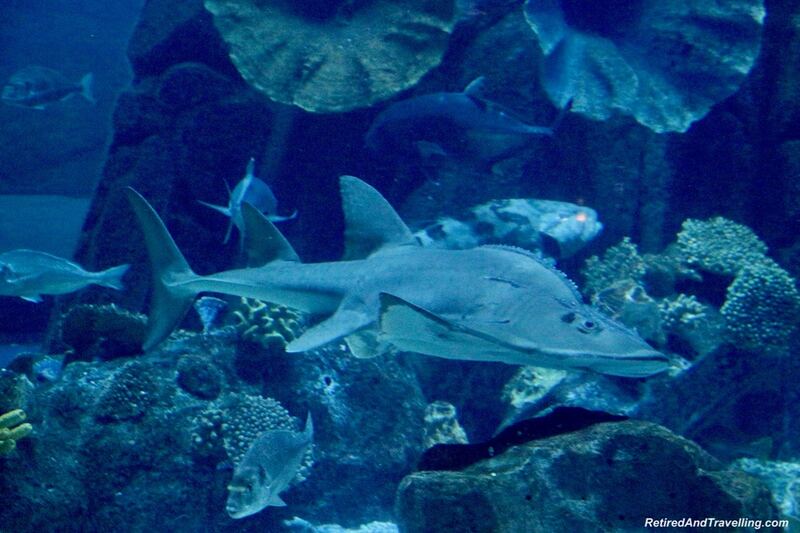 We are frequent visitors to Nassau, Bahamas and the Atlantis Resort there. 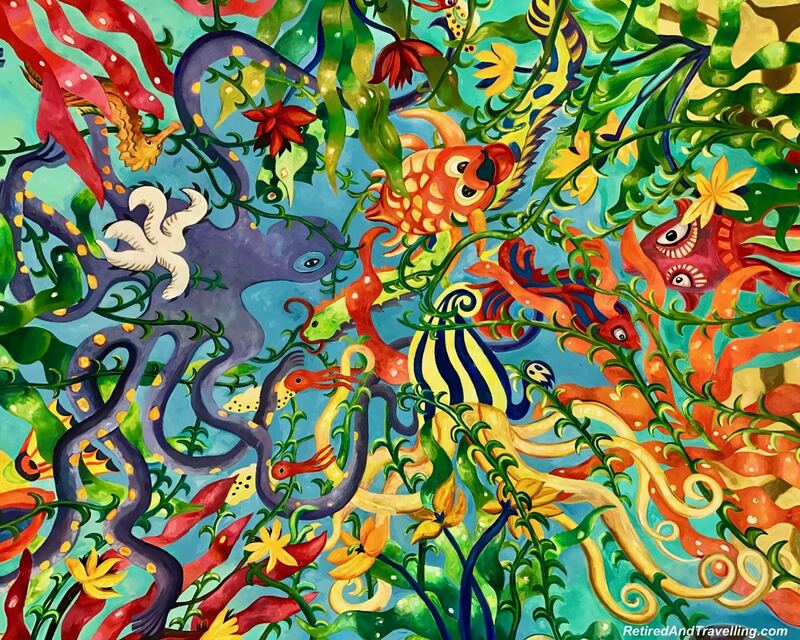 Many days were spent as we enjoyed the water parks, aquarium and pools. 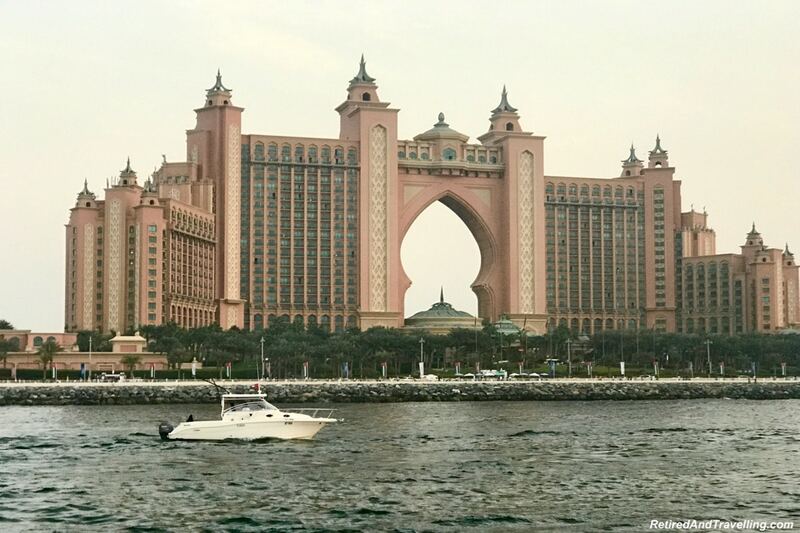 It was uncanny to see the Atlantis Dubai Resort. It had the same pink, turreted exterior. When we went inside, familiar sights greeted us. We walked past the shops, the casino and the massive aquarium. 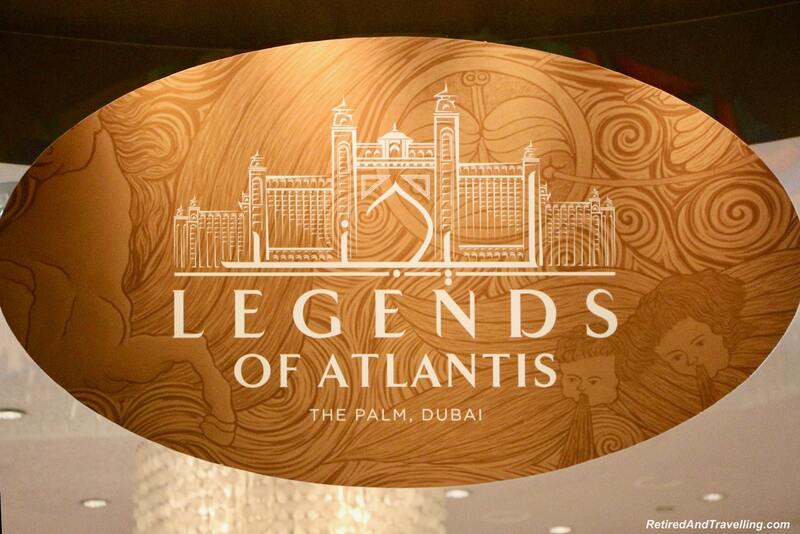 A visit to the Atlantis Dubai Resort can be a day trip on your list of things to do in Dubai! 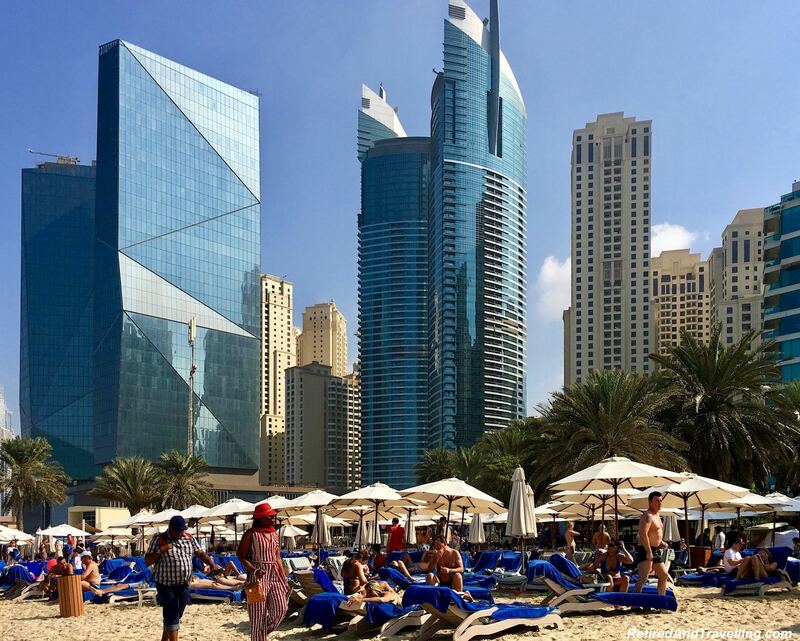 A short walk from where we stayed at the Intercontinental Dubai Marina, we found the JBR beach nestled under the hotels and condo buildings. It was a busy beach with tons of things to do. When we planned for our trip to Dubai, I went out and bought a new bathing suit that covered more skin. I wanted to be respectful of the local traditions. But we saw a lot of bare skin at the beach. Although we also did see a lot of fully robed people who must have melted in the heat! When we first got on the beach we saw a group of people gathered around the camels on the beach. Then we saw the people on camel rides picking their way between the towels. 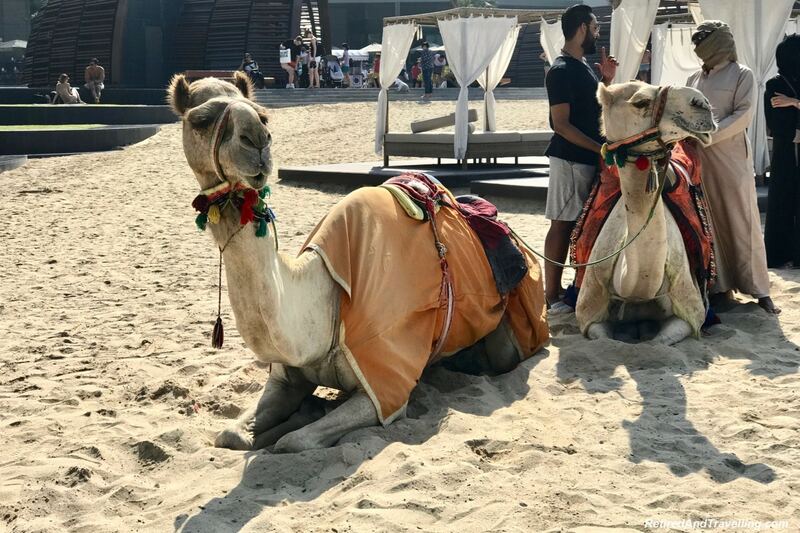 This was our first view of camels in Dubai. But we got an up-close view when we did our desert adventure. 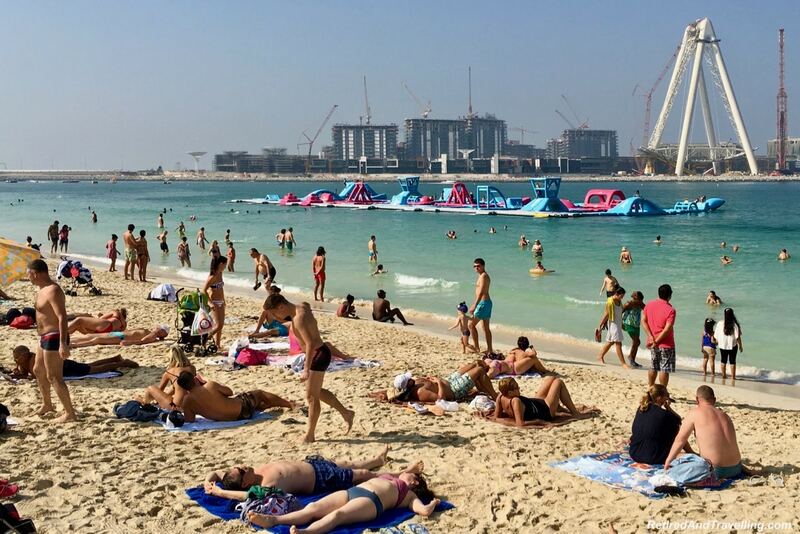 Spending some time on the sandy beaches with the clear blue water is definitely one of the things to do in Dubai! 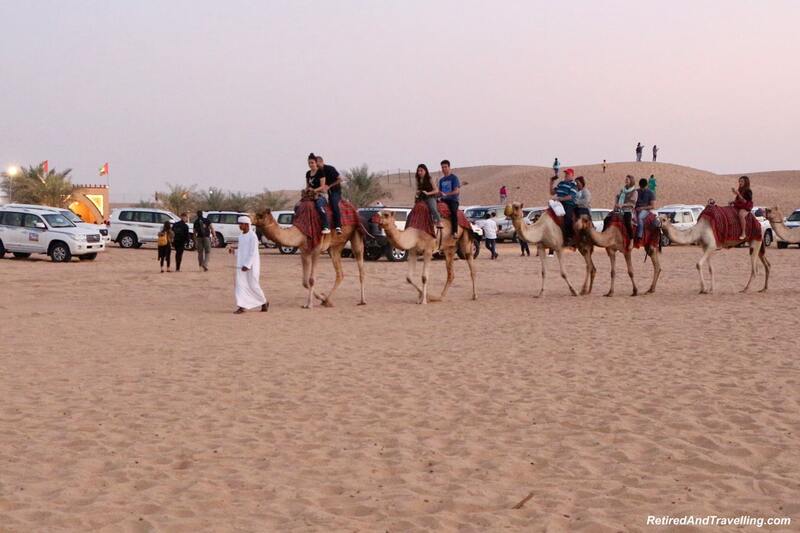 An authentic desert experience was at the top of our list of things to do in Dubai. We booked a desert adventure that took us out of the city. Our fun started with dune bashing. Not for the faint of heart! 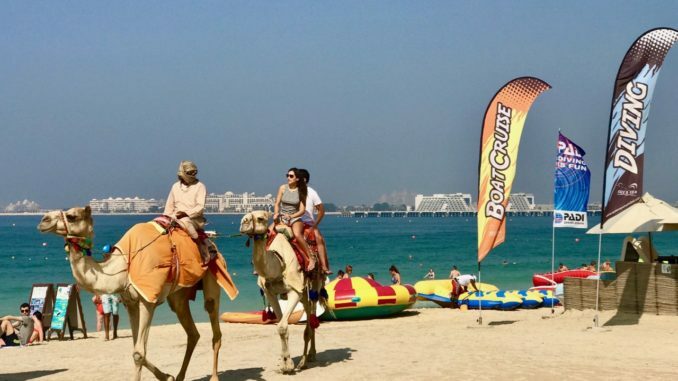 Since we had missed a camel ride on the beach, we made sure to have our first camel ride. 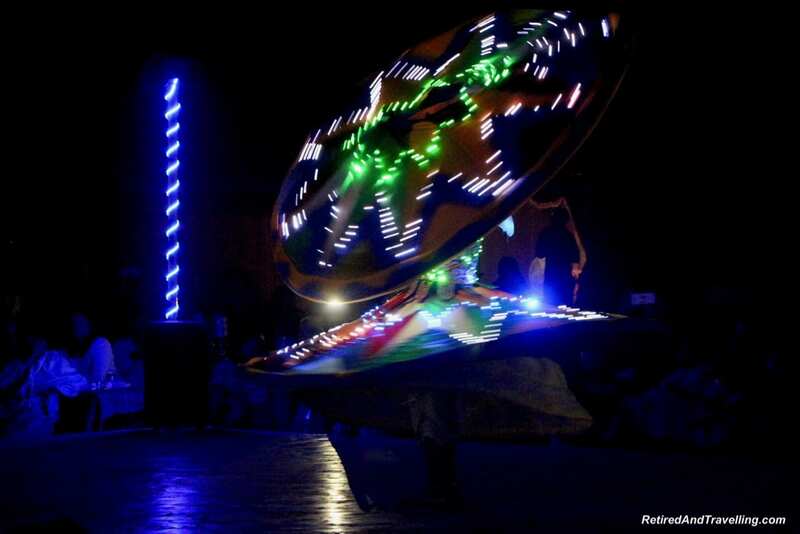 After we watched the sun set in the desert, we enjoyed a great Bedouin show with dinner. 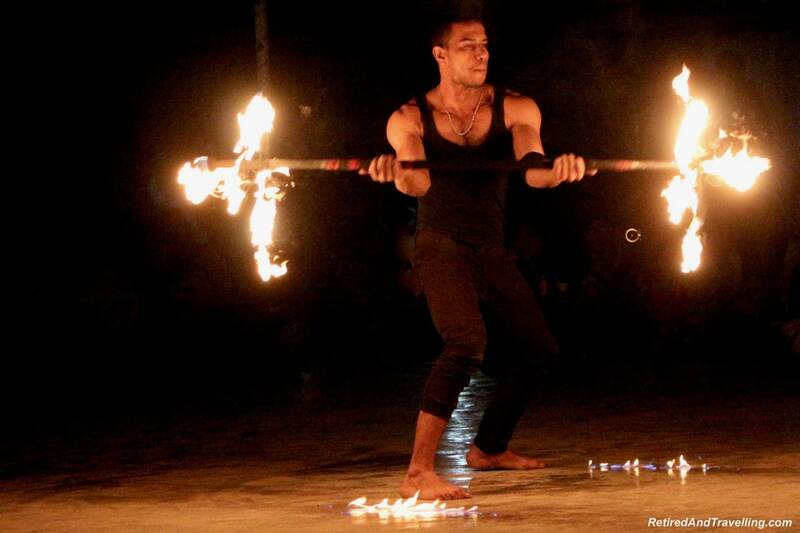 The fire show was entertaining and the spinner kept us mesmerized. 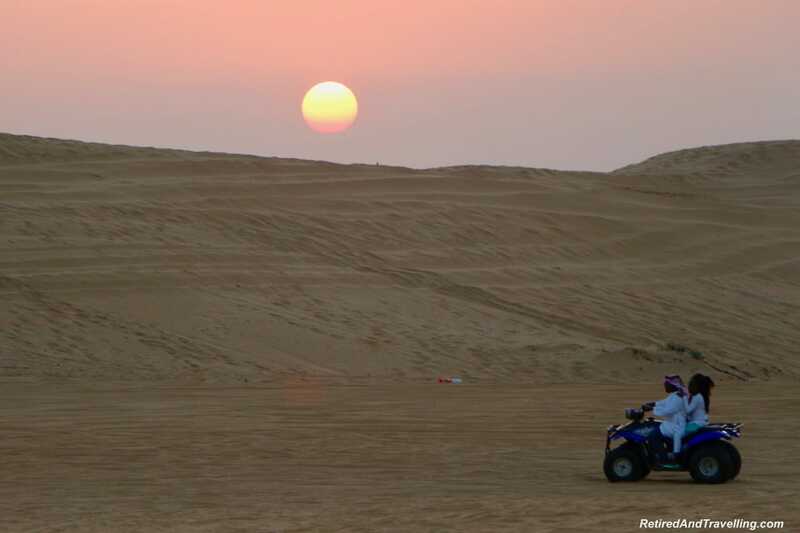 A desert adventure should definitely be on your list of things to do in Dubai. There were lots of options to take a short cruise around Dubai. A cruise alone the Dubai Creek gave us a view of a more traditional Dubai. 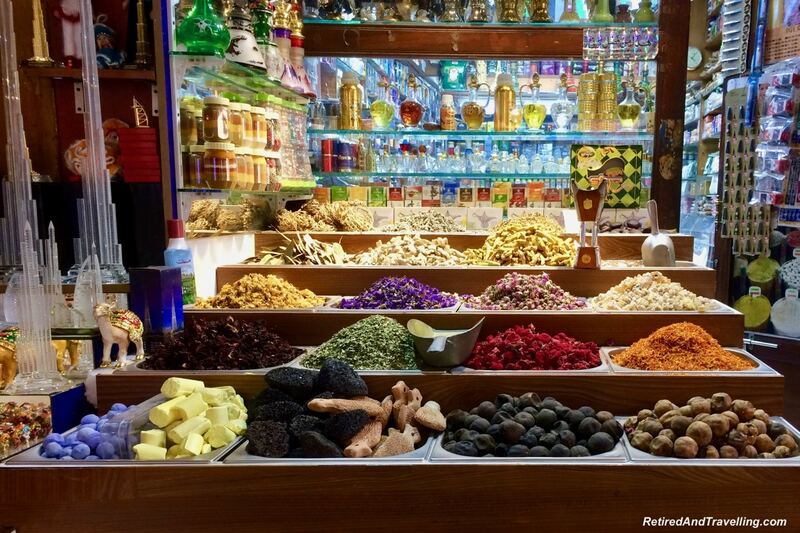 The spice and gold souks were in this area. 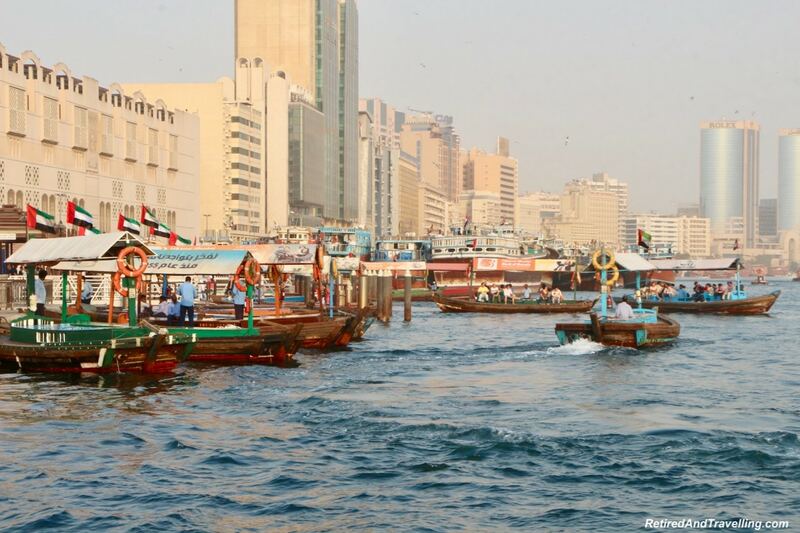 Traditional dhow boats were used as ferries across the channel. 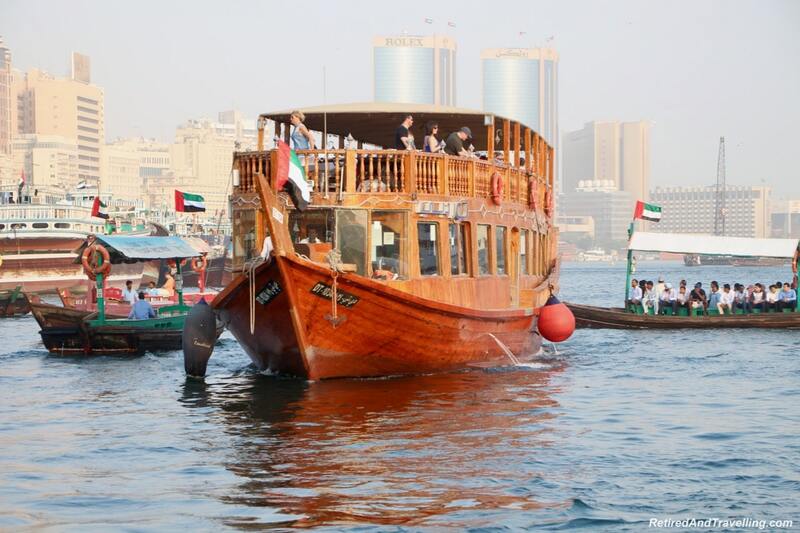 Larger dhow boats provided the tourist cruises. If we wanted some entertainment, the evening cruises provided dinner and music. 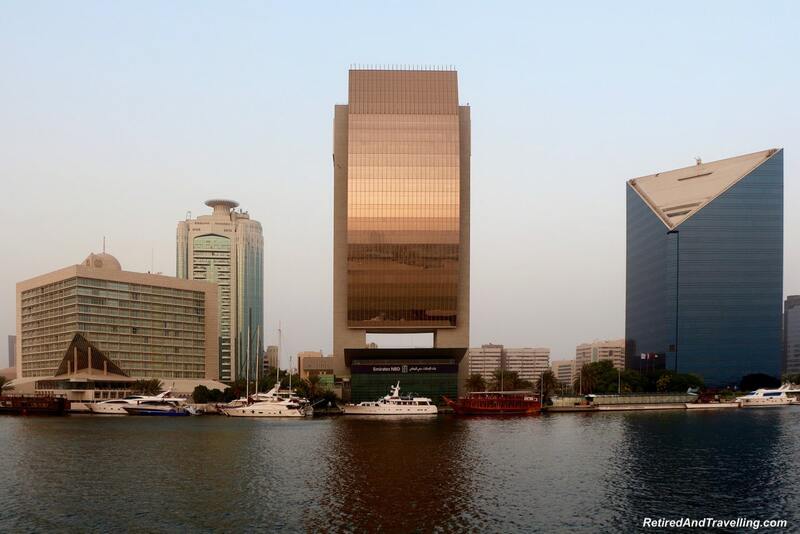 There was much to see along both shores of the Dubai Creek. 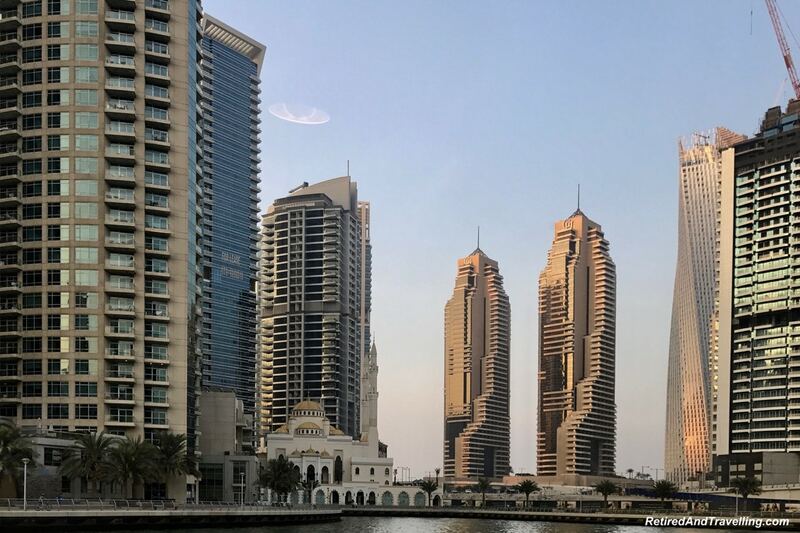 We stayed at the Intercontinental Dubai Marina. 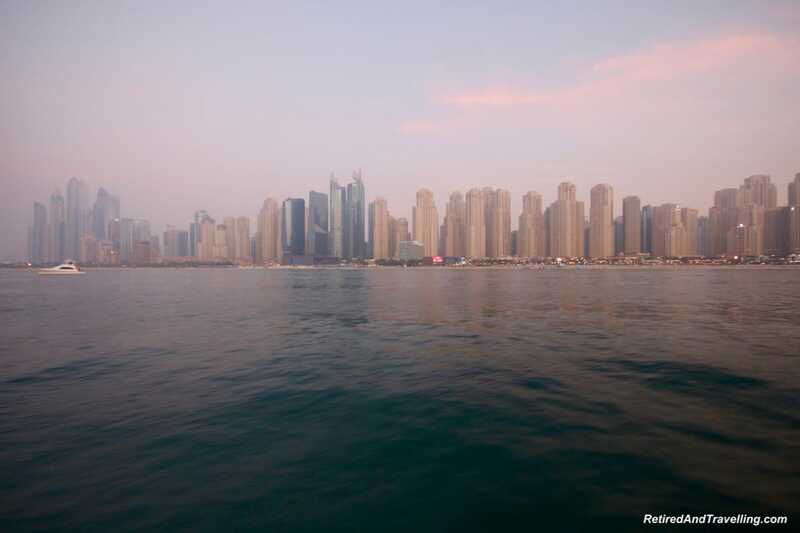 A tour from the Dubai Marina got us a different water experience. There were great views of the boats and buildings lining this canal. The tour then took us out along the Palm Jumeirah. 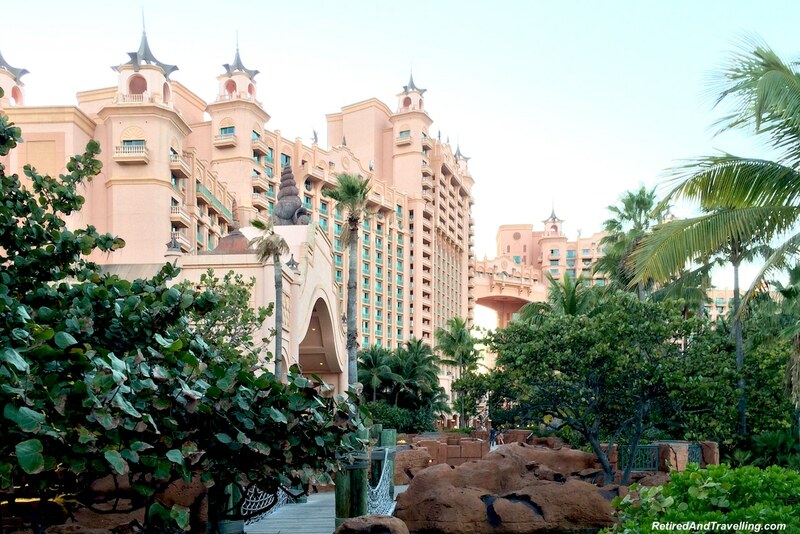 We got yet one more look at the Atlantis Resort from this perspective. As we headed back to the marina, we got a view of the marina skyline as the sun set. Back in the marina, we watched the boats and shops light up with brightly coloured neon. 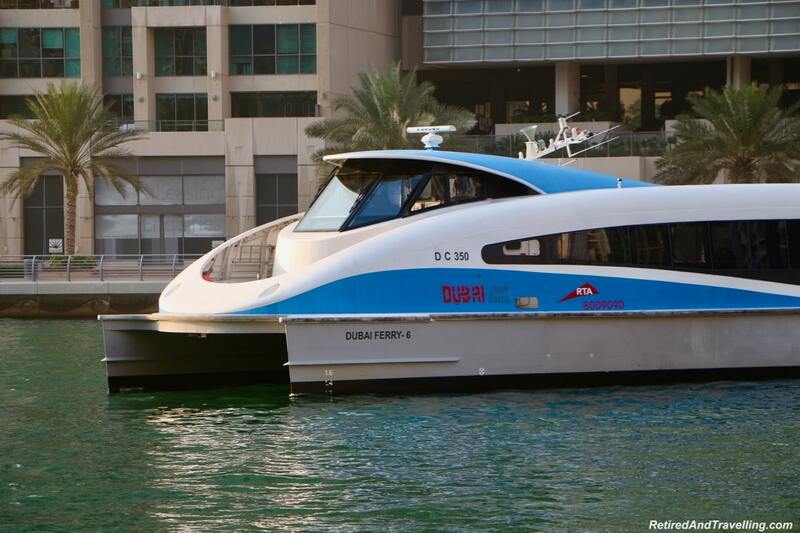 Taking a cruise is a great one of the things to do in Dubai. 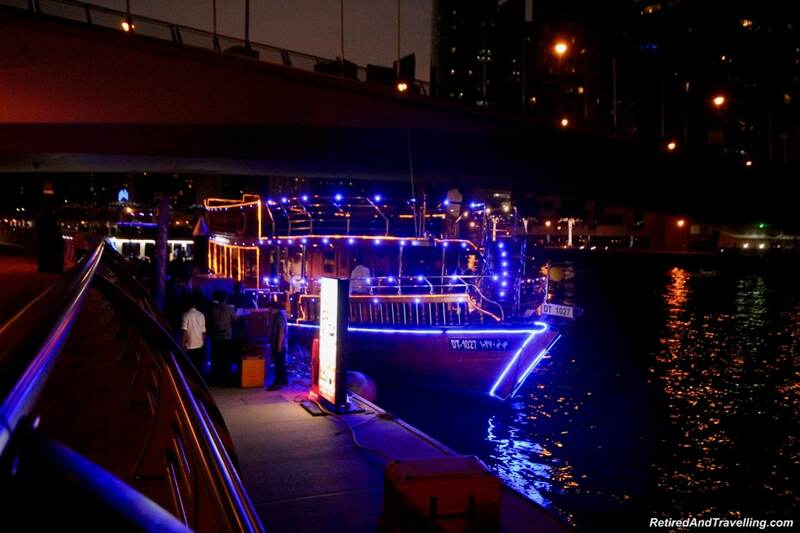 We took both the Dubai Creek and Marina tours and each one offered something interesting to see. A visit to the Dubai Mall is generally on the top of most people’s list of things to do in Dubai. We found the shopping to be expensive but we were not there to shop. People enjoyed the indoor skating rink and the aquarium. The divers on the fountain wall drew out attention. Everywhere we looked there was something else to see and do at the Dubai Mall. 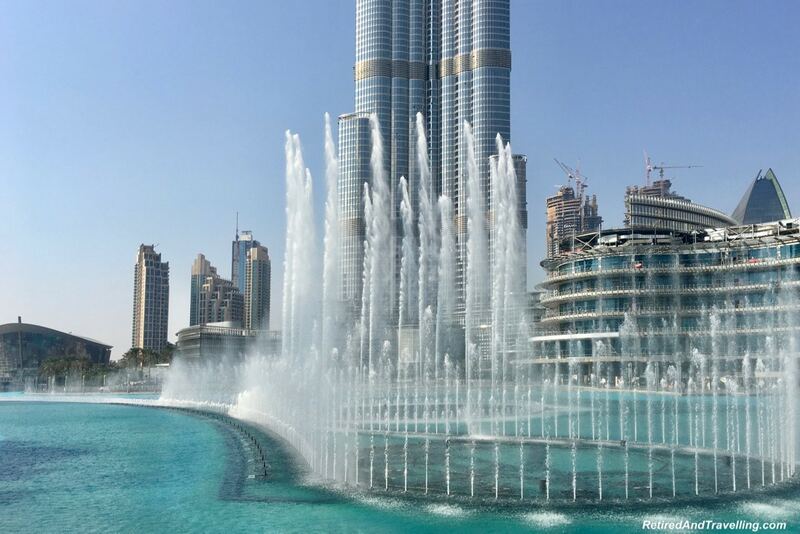 Our favourite attraction at the Dubai Mall was the fountain show under the Burj Khalifa. The fountain danced in synch to music. At night the fountain lights matched the music. 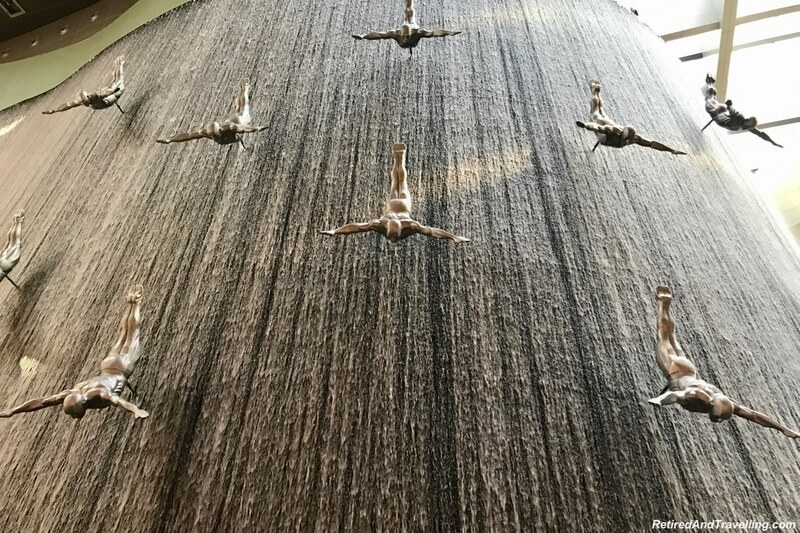 Don’t miss putting the Dubai Mall on your list of things to do in Dubai. 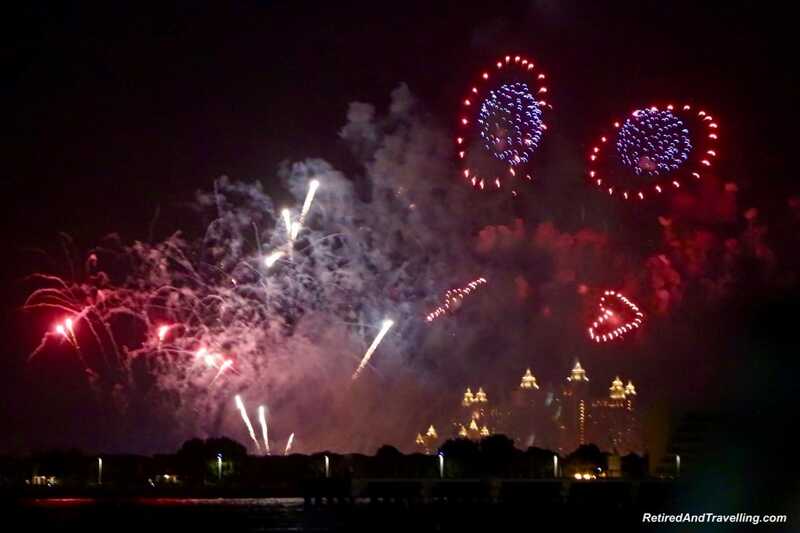 Dubai is a great place to celebrate New Year’s Eve. There are massive fireworks displays all around the city. We walked down to the JBR beach and muscled in with the crowd. 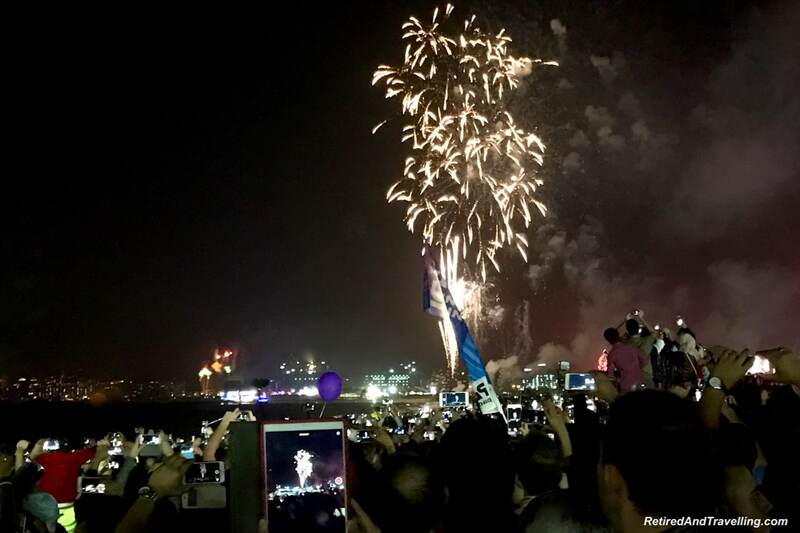 As the fireworks went off around the bay, the cellphones and iPads all were lifted to catch the show. We wanted to go downtown in Dubai to see the great fireworks display on the Burj Khalifa. But transportation into downtown was a major issue. If seeing the New Years Eve show on the Burj is one of the things to do in Dubai on your list, make sure you have a hotel close by. 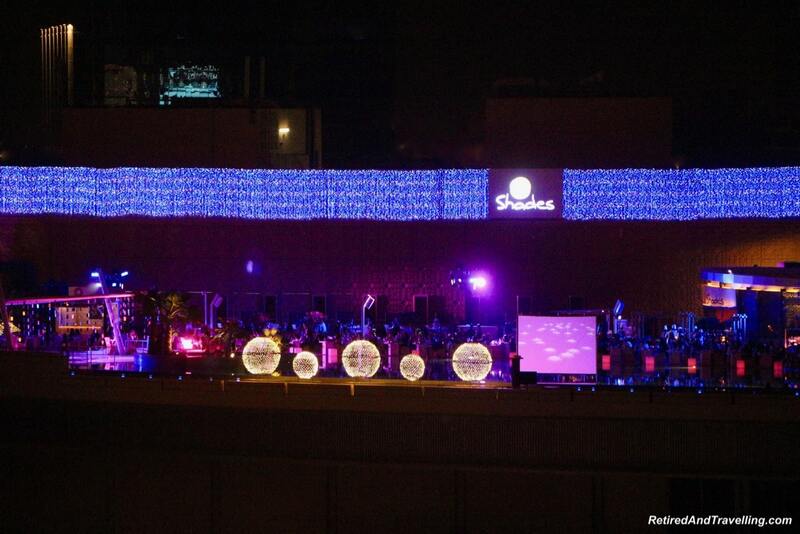 The lights and laser show will definitely be worth it. If you have exhausted the things to do in Dubai, it is an easy trip to visit the other emirates from Dubai. Abu Dhabi was a city very similar to Dubai with lots to see and do. It even has another Atlantis Resort! We also visited Fujairah. 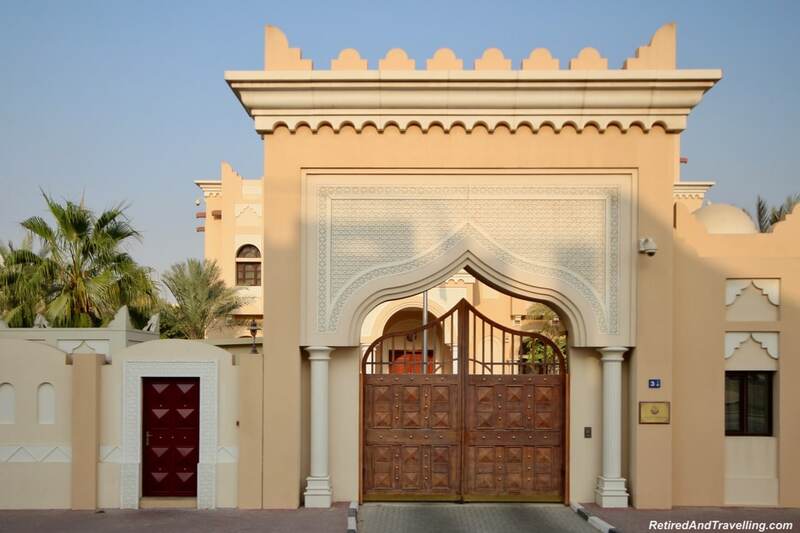 It was a very different emirate, more rural and traditional. 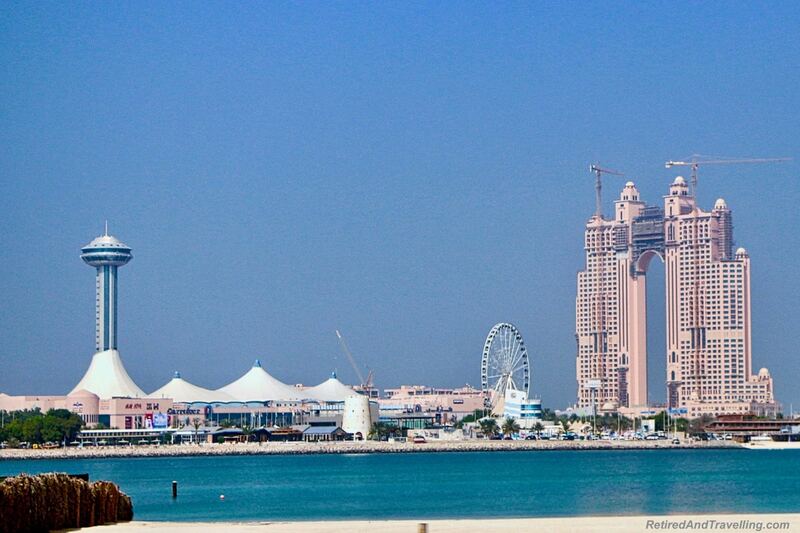 It is the only emirate that has mountains and lots of water. 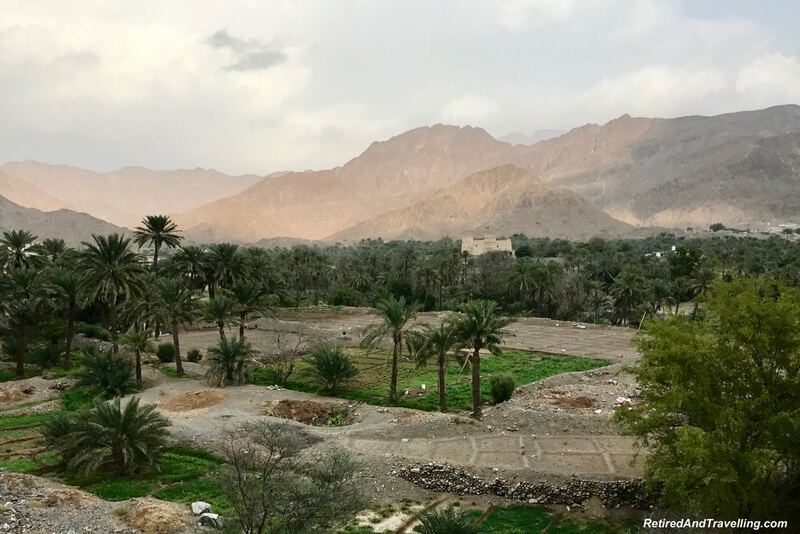 While you could consider a day trip to the other emirates, there is much to explore if you plan a longer stay. There were so many things to see and do in Dubai. We were kept busy for two different visits. There is something for just about everyone. And getting around Dubai was easier once we left the highways! But even after we went back to Dubai a second time for New Years, there was much left on our list of things to do in Dubai. 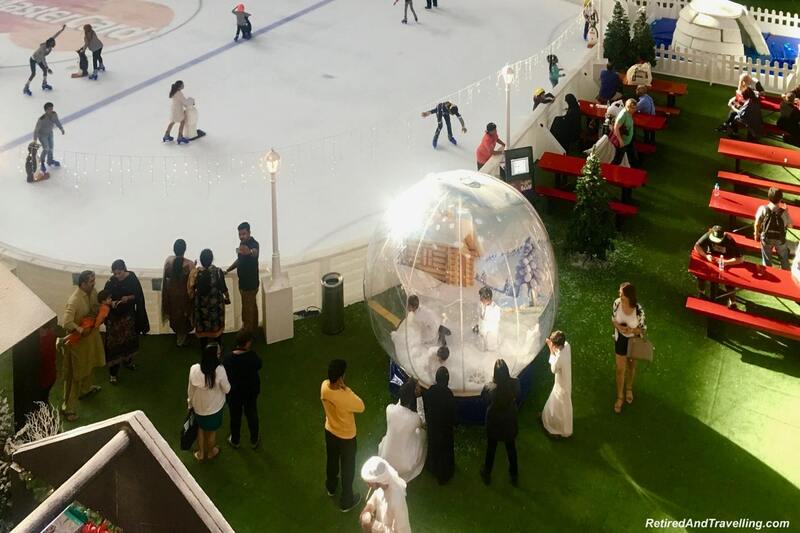 We missed the ski hill and other attractions at the Mall of the Emirates. We really wanted to go high and get a panoramic view of Dubai in a helicopter or small plane. And we missed going up the Burj Khalifa. When we visited Abu Dhabi, we didn’t get to drive the Ferraris. 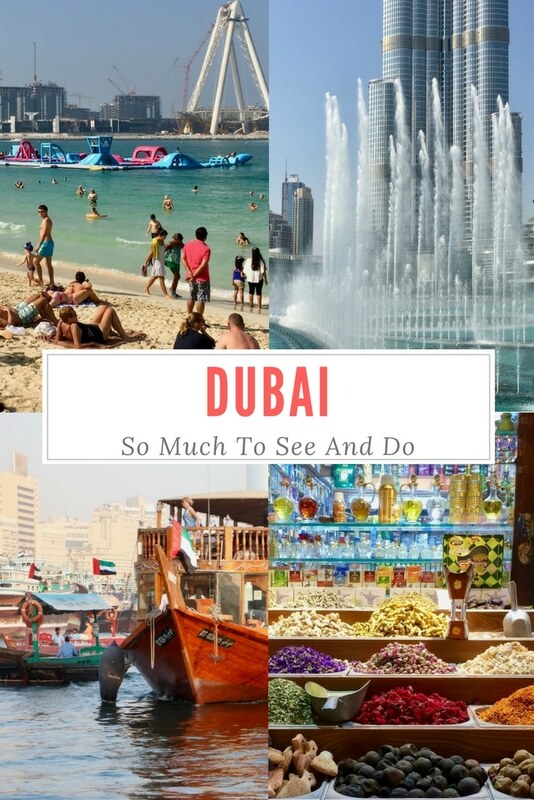 There are many things to do in Dubai that are still on our list! 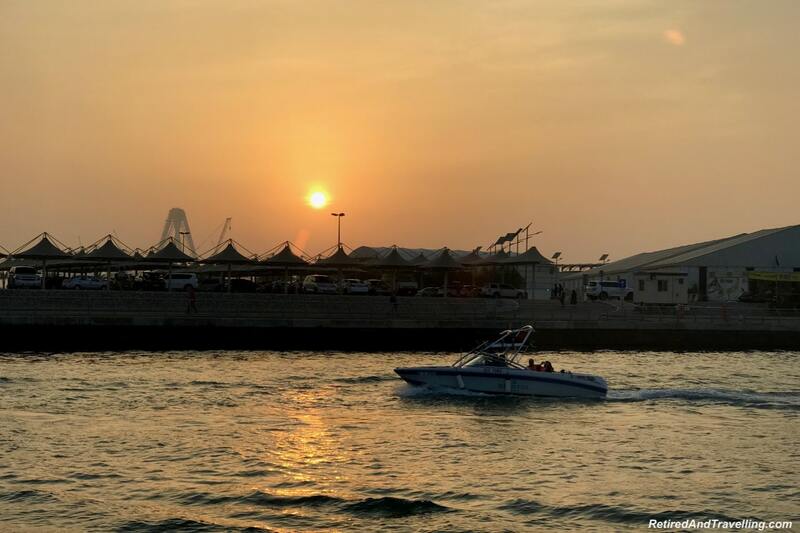 What was your favourite of the things to do in Dubai? What would you recommend giving a pass? The buildings and skyline are so striking, it’s something I love about Hong Kong too but the desert and spice souks would be top of my reasons for visiting Dubai, and a little shopping too I guess. Thanks for adding a few new must-dos for our list. I must visit one day. The desert is calling my name. And the architecture! This is a good post on Dubai. We thought an overnight layover was enough. But the Dubai Mall and Burj Khalifa are not all there is. Plus I didn’t know that Abu Dhabi is only a little more than an hour away and that Fujairah is a little more than 2! I loved reading your post about my city, I have been here for 7 years and I love it. 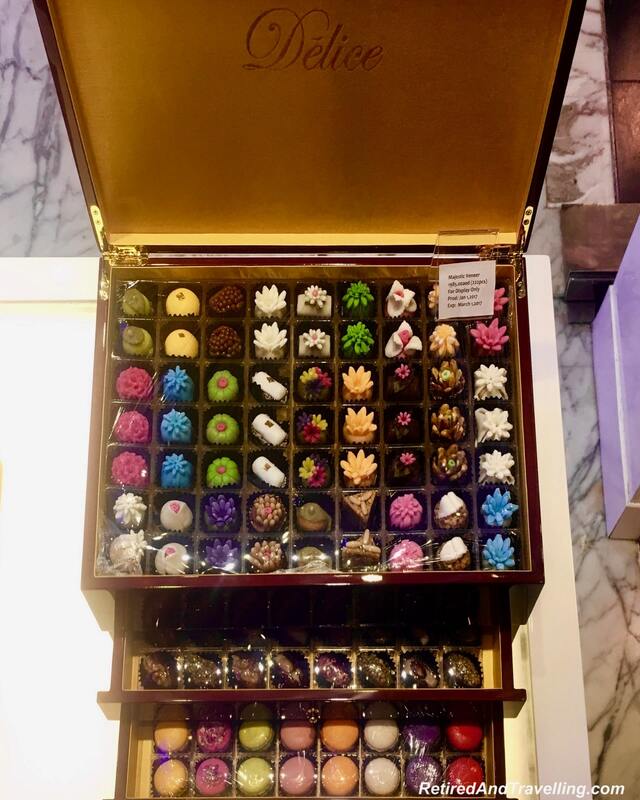 I think you’ve managed to get the most important and exciting things to do in Dubai, listed in this post. 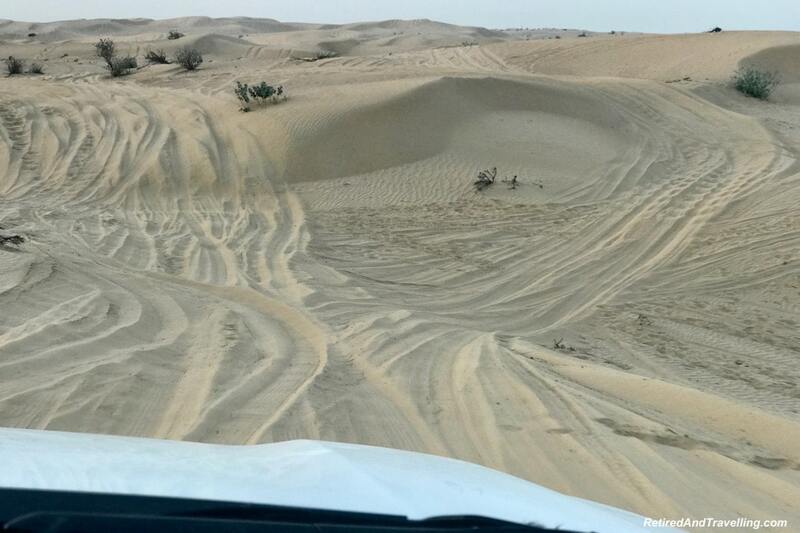 Definitely go into the desert and experience dune bashing or overnight camping, and cruising (there are so many options) over the creek or in the sea is also a great idea. 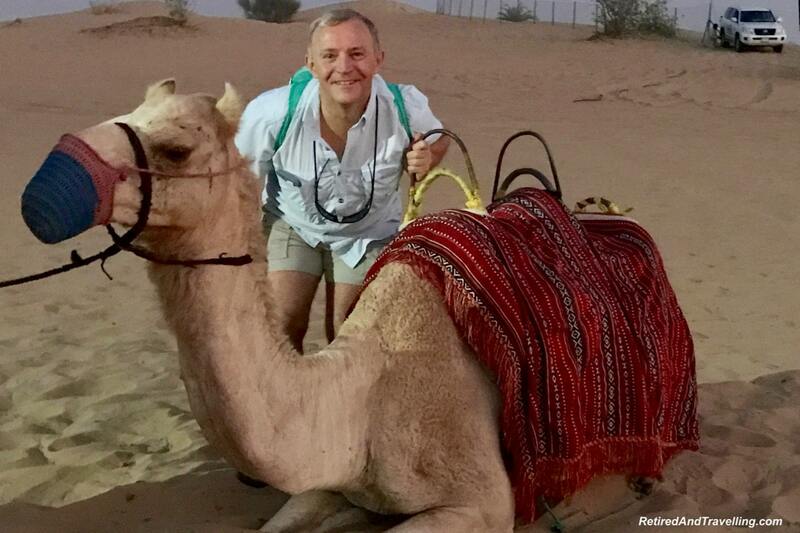 Of course, not to forget, enjoying the many wonders of the world in Dubai is a key thing to do! The cruise will be the highlight for me in this trip. Dubai is sure a city of tall buildings and I can’t help but keep looking up the last time I was there. And yes I agree with you, the architecture here is a goal, especially the mosques. I spent most of my time shopping with my friend who was a bride-to-be and it was so fun. 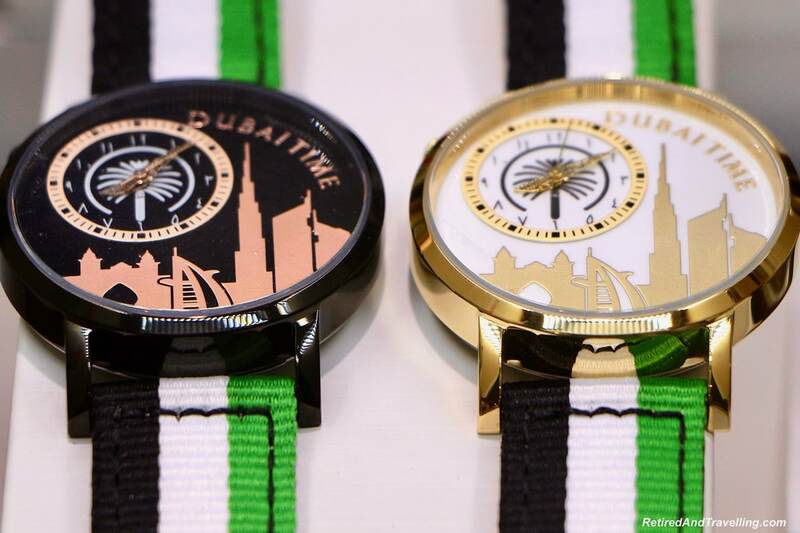 We’ve been to Dubai a few times, once for a holiday and again on stopovers. We were amazed how warm that sea water was, it was like swimming in a heated pool. One thing we haven’t done is a desert adventure, definitely something we must try next time. I think I managed to check off all but New Years on those actions when I visited a year ago, although you got way better pictures than I did. I also found it really interesting to see fully robed people at the beach, but that’s the culture. I’d love to go back on the desert safari, even knowing how touristy and un-authentic they are. I like your comment about staying in the desert a few nights. That’s exactly my cup of tea. Dubai is indeed a mind-boggling mosaic of experiences. Love the fact that there is a complete range of things to do from adventure, culture, food, leisure, and architecture. We were there for a short trip late last year and loved it. 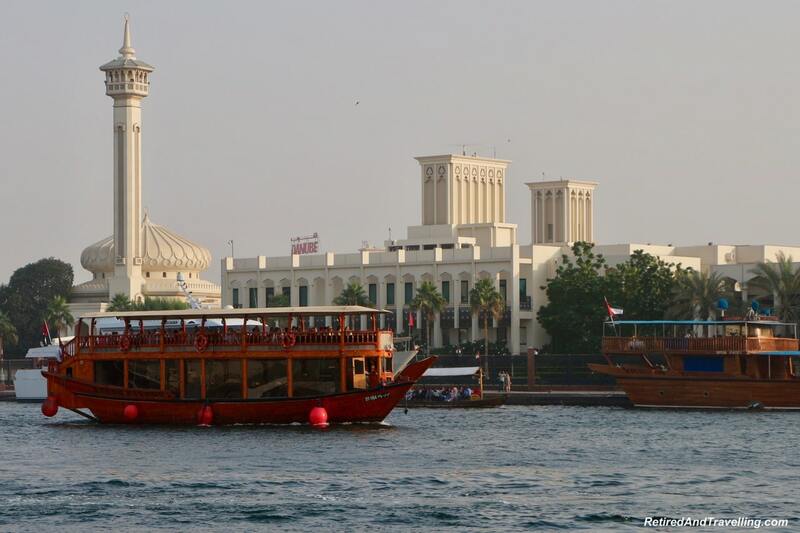 Apart from the futuristic malls and buildings of Dubai we loved the dhow cruise. We need to head back for more. What a lot of the things you have been able to cover and I think you have visited all the usual places and a bit more. Like you say, the city is in such stark contrast to the desert . 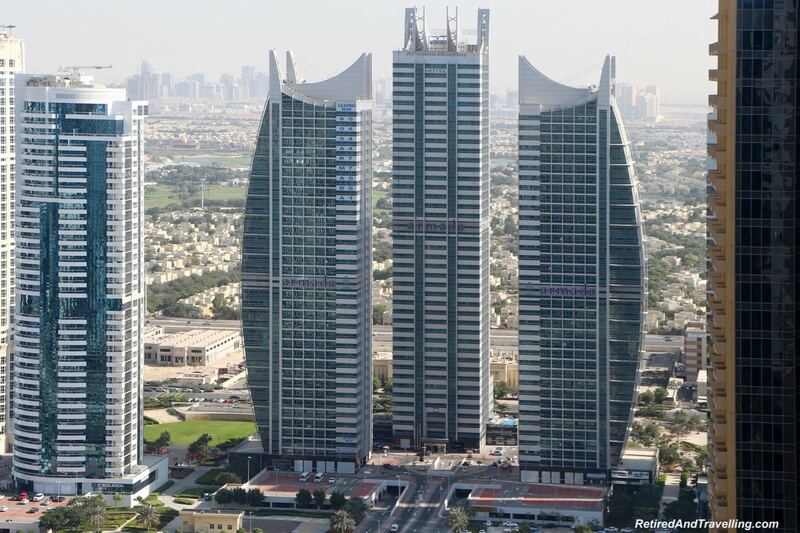 It is indeed incredible and commendable how they have been able to build and maintain such high-rises on a desert! I loved both Dubai and Abu Dhabi. I would definitely return. Plenty to do with even more. 2 months left before I go to Dubai. Im so exited to explore both the modern and traditional Dubai- and go shopping off course. 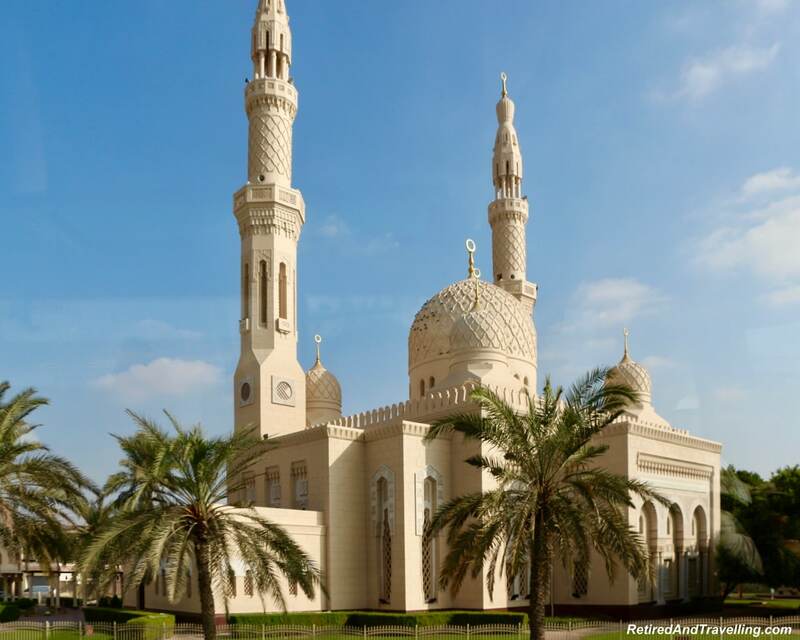 I think I will take a day trip to Abu Dhabi to see the mosque and the Louvre. Dubai seems to be the ultimate travel destination these days and I can see why. So much to see and do there. I’m sure the more time you spend there the more great things to do you discover, but for now I’d be happy to just do some on your list. Hopefully sometimes soon my husband will retire to so that we can start traveling more seriously. I am glad I found your post. 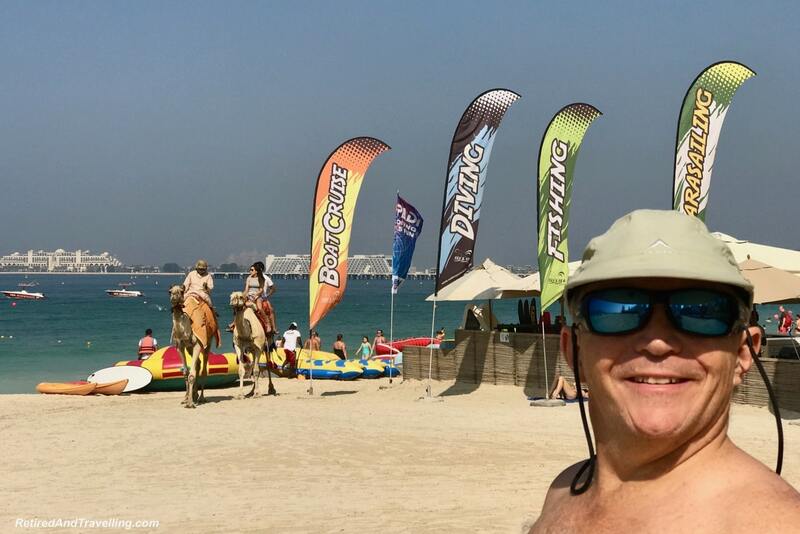 I recently started my Dubai travel blog and visited several places. Your information is very genuine. Keep doing great work.